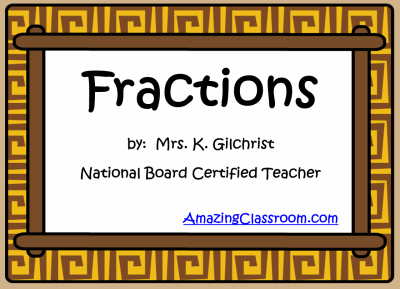 This smart notebook lesson teaches students to identify fractions as part of a whole, part of a group, or part of a set. During this lesson students will be introduced to fractions of shapes and be asked to color in certain portions of those shapes to match the fraction given. Students also have opportunity to use response voters. This flipchart includes multiple activities for student interaction and engagement with the Smartboard/whiteboard. 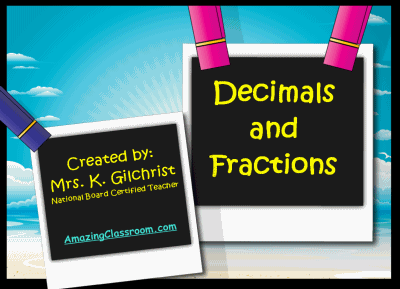 This notebook lesson will teach your students how to write decimals as fractions up to the thousandths place. This flipchart contains, containers for student interaction with the Smartboard. True/false and multiple choice questions are included in the assessment section. A short review about mixed numbers is also included. Enjoy! 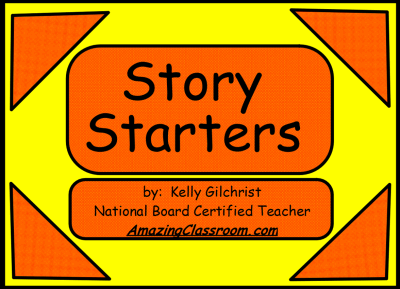 This Smart notebook file will get your students brainstorming to write fantastic stories! First they choose from over 50 locations including: the city, the beach, the desert, and the pyramids. After choosing a location, they are taken there and can choose from many items to add to their story. Once they have a story in mind, they can get started writing about it. 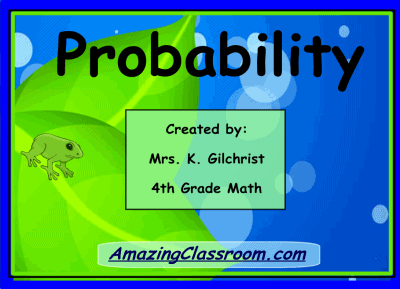 Colorful photos and clip-art make this 60+ page lesson irresistible to students. 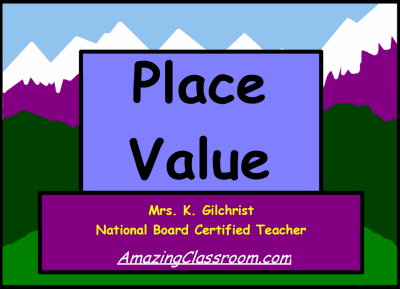 This is a great lesson on place value of whole numbers to the millions place. Students will learn to place numbers and commas in their correct locations. It includes video links, internet game links, response voting questions for assessment, and some audio content. This lesson involves a tremendous amount of student interaction and will keep them interested throughout. This Notebook lesson includes over 40 pages of fun and interaction! Enjoy! 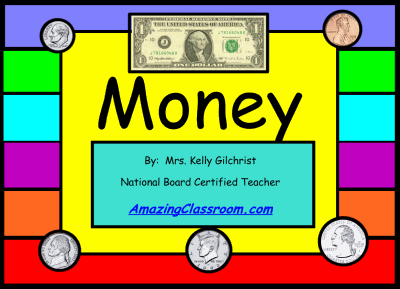 In this lesson students will learn to identify coins & bills, their values, and the important people on them. They will progress into counting coins & paper money, practice understanding their values, and making change up to $20.00. This is an extensive lesson that has a ton of student interaction, games, videos and loads of Response voting questions to assess understanding. This lesson contains over 60 pages of student interactivity. Have fun! After this 39 page lesson, your students will be able to correctly identify whether a particular event is impossible, likely, unlikely, or certain. They will be able to identify the probability of rolling any one number on a die, and the probability of getting heads or tails on a coin. There are a couple of short video clips embedded in the notebook file, along with several Smart response voting questions to assess your students afterwards. Fun! 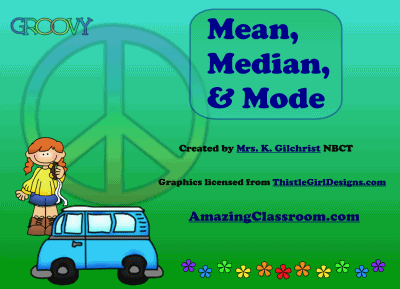 This notebook file introduces students to the concept of mean, median, and mode. It is very interactive and allows many opportunities for students to interact with your smart-board. This lesson contains 24 pages showing students how to figure the mean, median, and mode. Ten response voting pages are included. Have fun learning! This 33 page Smart notebook lesson is a colorful introduction to finding the area of shapes. It starts with shapes on a grid and moves into free-standing squares, rectangles, and even triangles, all with step by step instructions. Several activities that allow student interaction with the smartboard are included, such as response voting and activity builder matching with sounds. Update your software to Smart Notebook 11 for full functionality. This character, setting, and event Smart Notebook file is a great tool for students to use in selecting a topic for writing. No more brainstorming! 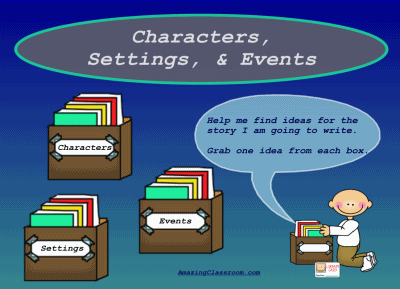 Use this file to let your students pull out a character, setting, & event for their story. There are 21 of each character, setting, and event story starters on each of the pages. Students click the book boxes to go to each section & choose one from each. My students love using this for writing ideas. 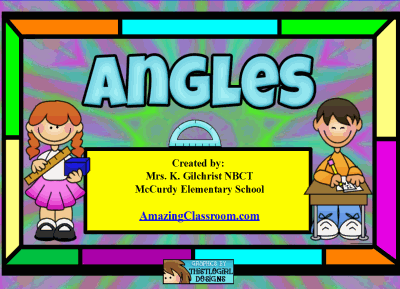 This is an outstanding lesson to introduce angles, how angles are made, how they are measured using a protractor, and the four kinds of angles: right, straight, obtuse, and acute. This lesson contains a short video clip that demonstrates the proper usage of a protractor. It also incorporates Smart Response question voting, student interaction with the whiteboard, and the Anglemaker 3000! Have Fun!